The same windstorm that destroyed the climbing tree and leveled the autumn olive also damaged in the vineyard. Luckily, no vines were harmed in the roaring of this windstorm. Only a few metal supports slipped off the posts causing the thatching was lean over a little. Whew! 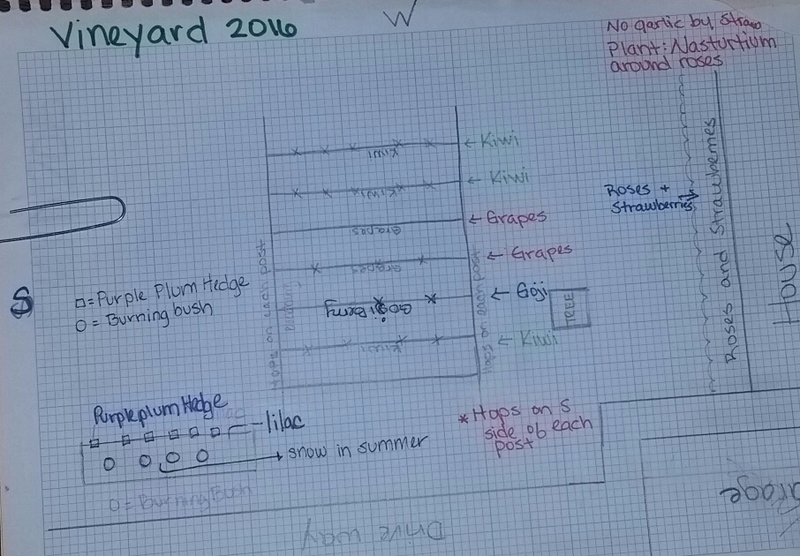 I’ve ordered three Einset Seedless grapes to plant in the row next to the wine grapes. The variety we planted two years ago did not make it through the winter. This year, with any luck, we’ll have fruit from the kiwi and the grapes will once again ripen. The wire we’ve been using with both the kiwi and grapes is not enough to support the heavy vines that will be even heavier when bearing fruit. So we’ll be adding stronger supports this year. Unless something else pops up, I think we’ll use cattle panels as our replacement. They probably won’t be easy on the eyes at first, but they will do the job and once the vines are grown the vineyard will be a beautiful paradise of kiwi, hops, grapes and goji berries. We’ll need to carefully untangle the vines and delicately twine them around the new supports. This will require a gentle hand and a patient temperament. This entry was posted in Garden Stories, Haiku, Poetry, Writing. Bookmark the permalink.